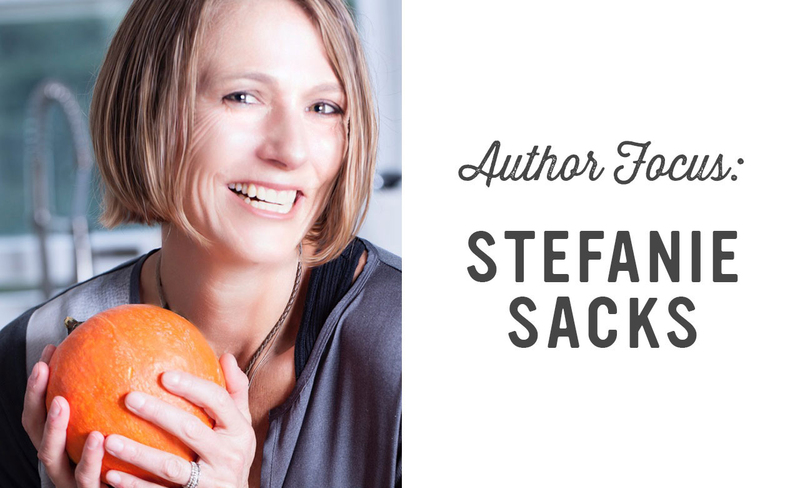 Stefanie Sacks, MS, CNS, CDN is a Culinary Nutritionist, author, consultant, speaker and food firebrand! She has her Masters of Science in nutrition from Columbia University, is a Certified Nutrition Specialist, Certified Dietitian Nutritionist and is a graduate of the Natural Gourmet Institute for Health and Culinary Arts. Stefanie works hands-on with individuals and groups seeking a healthier way of eating. For companies and organizations looking to do the right thing for their consumers and environment, Stefanie is the go-to-gal—her unique background in food and agriculture as well as health and wellness gives her the knowledge and skills to guide groups towards true food transparency, sustainability and ultimately health. 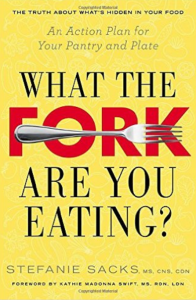 Her book, What The Fork Are You Eating? An Action Plan for Your Pantry and Plate (Tarcher/Penguin Random House) provides an aisle-by-aisle rundown on how to shop and cook healthier. Mariah: In your book, What the Fork Are You Eating?, you call yourself a “moderationist,” when it comes to your diet. Can you explain what that means? Mariah: How can we pass on this view of food to our children? Stefanie: Before we can pass anything on to our children about food and food choice, we must first get our own authentic edible education (and try to work out personal food issues if we have any!). That’s why I had to write, What The Fork Are You Eating? Sadly, too many people are highly misguided thus I felt a burning need to create a usable (and highly credible) tool for grown-ups and their children. When we have a truthful body of knowledge and counsel on how to communicate with our kids (something I talk about in the book) then we are ready to inspire, empower and offer sustainable guidance. Mariah: What are some tips for raising children who make healthy choices about the foods they eat? Stefanie: I am a huge proponent of getting kids in the kitchen the moment they can sit in a high chair. I even cooked with my sons while attached to me in their Baby Bjorn. I also took them food shopping and to this day (they are 7 and 10), they are my supermarket sidekicks and help choose foods as we walk the aisles. We also love to frequent farmers markets in season. And my younger son loves to put the groceries away. The more exposure to food, the better. And talking about nourishment as you go is critical. That’s why knowing the right information is important. Because then you can guide them towards healthier choices by shining light in the darkness. Talk about everything from ingredients in packaged foods to flavors in the foods you prepare. And have them cook alongside you (and clean)! Oh, and plant some pots of herbs or create a garden if you haven’t already—another super useful tool for raising healthy eaters! Mariah: What are some of the biggest lessons you have learned about trying to pass on your knowledge of food to your children? Have you made any mistakes we can learn from? Stefanie: I have two boys with two very different palates and eating styles. My older son is a dream eater, my younger would eat jelly beans for breakfast if he could. Thus I have learned to honor what both boys can and will do and guide them towards better when I can. It was very hard for me to do that with my younger son initially. He had clinical feeding problems upon birth (he was born tongue tied and had issues coordinating sucking and swallowing) and I wanted to fix everything. He didn’t touch solid foods until 8 months and when he did, he threw everything up. He denied anything I gave him and I was heartbroken daily as nourishment is what I do—I could help others but I couldn’t help my own son. So I had to step aside and let my husband take the lead. In time I learned to back off and with doing so, we found a balance. He is still a challenge so I have to continually adapt. And I do but it remains a constant uphill battle. I don’t stop involving him in everything food, I just respect the space he needs around what and how he eats. But I can assure you that it is not jelly beans for breakfast! Before I had kids, I vowed never to be the mom who forbids anything (other than Gatorade, soda and anything artificially sweetened). I had worked with too many parents who did just that and in trying to keep their kids “healthy” they in fact created junk food addicts. So, my kids are like every other kid. When they want super bad junk (like at birthday parties or movies), I allow it but also talk to them about the decisions they are making. After that, I let them choose. Typically they both go for something super colorful but after a few bites, they are done. Though my little one may opt into more than just a “few” bites! The lessons here are that we must respect funny little eating habits and not force our ideals down our children’s throats. There is no such thing as “food perfection.” Gently offering guidance and giving space will empower kids to do the “right” thing. And as parents, it is our job to provide our them with a variety of healthy foods to choose from daily and to continually offer them an edible education.